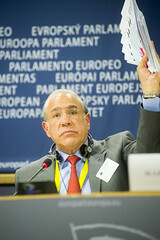 Remarks by Angel Gurría, OECD Secretary-General, delivered at the Opening Session of the OPEN DAYS 2014 European Week of Regions and Cities, "Smart Investment in Regions and Cities"
I am very pleased to join you for the start of the OPEN DAYS 2014. The OECD has worked closely with both the European Commission and the Committee of Regions for many years and we continue to do so to promote effective regional development. In this respect, only a few hours ago, the OECD signed a Memorandum of Understanding with the Committee of the Regions, recognising our prior work together and committing us to collaborating more systematically hence forth. This year’s OPEN DAYS are very aptly entitled: “Growing together – Smart investment for people”. Six years into the crisis, Europe’s citizens are demanding more growth, more jobs, a higher quality of life and a greener future. The list is long, perhaps too long for the scarce investment resources at hand. Investing them effectively and strategically, therefore, will be critical if we are to make progress in our goals: fulfilling citizens’ needs. Sub-national governments are responsible for the bulk of public investment. In 2012, they accounted for 72% of the USD 1.2 trillion in direct public investment. Pressure on public budgets to sustain unemployment, welfare and health spending has meant that public investment has served as the “adjustment variable” in recent years. Between 2007 and 2012, the volume of sub-national investment across the OECD decreased by 4%. Today, I would like to highlight a number of policy avenues and governance tools we are developing to address “why”, “where” and “how” future investment can have a long-lasting and positive impact. This is also the focus of the two OECD publications we are launching: The 2014 OECD Regional Outlook and How’s Life in Your Region? We are very much aware that what matters most for our societies goes well beyond GDP growth and GDP per capita. To drive our decisions and design better policies, we can’t just look at the odometer; we need to look at the full dashboard of indicators that matter for well-being. At the OECD, we constructed a dashboard of national well-being indicators with our “Better Life Index”, launched in 2011. Now we have taken that work a step further to focus on the regions, because most factors that really affect people’s daily lives are very much determined at the local level. I urge you to explore our interactive website “How's life in your region?” which allows users to compare 362 regions, in 34 countries, and on 9 distinct dimensions which are related to quality of life. You can see, for example, how Tuscany shapes up against Texas on health; or how Saxony compares to Kansai on unemployment. Material conditions such as access to educational opportunities and jobs; and non-material conditions such as health, a clean environment, and safety, play equally important roles in well-being. And many of these factors depend, to a great extent, on where you live – national averages often tell us little. The report highlights the need to better understand how public investment translates into jobs and equal opportunities for citizens, thereby raising everybody’s well-being. Often we measure what we can easily count, such as the number of hospital beds. But this doesn't tell you much about whether people are healthy. Focusing on outcomes helps draw out the synergies among different aspects of well-being and provides useful food for thought to policymakers. Effective targeting of investment can have greater impact when serving multiple well-being dimensions simultaneously. For example, the greening of infrastructure may not only have environmental benefits, but also contribute to job creation. As urban centres grow, targeted investment remains essential. Two out of three people in the OECD live in cities. If one considers cities defined on the basis of actual human settlement and activity, rather than administrative boundaries, the world looks rather different. That is why the OECD has developed a Metropolitan Database which mapped almost 1,200 urban areas, on the basis of a common definition and method, including a larger dataset for the 275 largest cities – home to half the OECD population. This new approach allows us to examine the many different ties between urban and rural areas. Rural areas, for example, offer residents of small and medium-sized cities, as well as large metropolitan areas, many amenities. The same can be said for cities of course, which can have a positive impact on growth in places up to 200 kilometres away. These facts call into question the urban-rural divide and underscore the need for innovative approaches to governing across that divide. Together with the European Commission, we have developed analysis and recommendations concerning rural-urban partnerships for regional development. Cities generate productivity but also have costs, just as wages tend to be higher in cities, so do prices. There are however additional non-monetary costs such as air pollution, noise levels, and commuting times – all of which affect well-being considerably. Well-organised cities can mitigate some of these urban disadvantages. More efficient public transport, for instance, reduces travel times, improves air quality and lowers CO2 emissions. It also extends the range of job opportunities which citizens can access. Unfortunately, too many of our cities fail to reap these benefits. Adjacent municipalities in large metropolitan regions too often compete rather than co-operate, and the resulting fragmentation of the urban space can negate many of the potential benefits. The evidence shows that overcoming metropolitan fragmentation can lead to better economic and environmental performance and higher citizen satisfaction. How to invest? Through better cooperation across all levels of government. One of the main challenges at the EU local level is the sheer number of the sub-national governments – which currently stands at over 90,000. Many were established long ago, in a very different world. The boundaries of France’s départements, for example, were drawn on the basis of a day’s travel on horseback. And apart from a few recent mergers, Sweden’s counties have had similar boundaries since 1634. Of course we do not need to redraw the maps, but we do need to think about whether these structures are efficient and match today’s realities, in both urban and rural areas. As reported in our 2014 Regional Outlook, almost half of OECD countries have recently implemented, or are in the process of putting in place municipal or metropolitan reforms. A reform doesn't automatically result in public budget cost savings, so each country needs to consider carefully why and how it conducts such reforms. - How to ensure proper investment frameworks. We are pleased that the Committee of the Regions has endorsed these Principles, and that the latest Cohesion Policy and Partnership Agreements also adopt many of these good practices. I hope that the two OECD reports we are launching here today offer valuable tools to help you in your work of promoting fairer and greener growth and in improving people’s daily lives and the well-being of future generations. In our globalised and fast paced world, citizens are becoming increasingly disillusioned and ‘lost’. They are losing trust in institutions. Our collaboration is becoming all the more important to help governments develop better policies for better lives. I look forward to our debate. Thank you.